Despite concerns that the global demand for coal is in an "irreversible" slide, a legislative panel on Wednesday advanced Utah&apos;s proposed $53 million investment in the coal-export business. 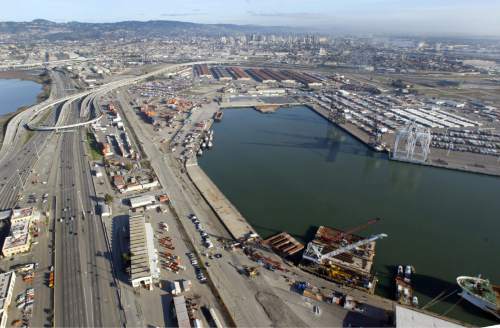 On a 4-1 vote, the Senate Government Operations and Political Subdivisions Committee approved the controversial measure to send sales-tax revenue toward building a deep-water export terminal at the former Oakland Army Base in California. The bill surfaced late Monday, prompting critics to accuse lawmakers of hustling the bills through the waning days of the legislative session to minimize public scrutiny. But the investment is needed to feed the economic future of rural Utah, which has not been participating in the state&apos;s prosperity, said Sen. Stuart Adams, R-Layton, sponsor of SB246. "The biggest growth of our economy is in exports. We have all kinds of products we can get to not only U.S. markets but foreign markets," Adams said. "We need to make sure we can get our products from rural parts of the state to market, especially mineral products." But foreign markets are soft on mineral products, especially coal, argued Tim Wagner of Utah Physicians for a Healthy Environment, ticking off the names of coal corporations that have declared bankruptcy in recent months. He described the bill as one of the most poorly reasoned pieces of legislation he has ever seen. "If this loan would guarantee 300 to 400 percent return, coal companies or private capital would be lined up to invest in the terminal. The lack of private investment suggests that this project is highly risky, and one that only could be accomplished by tapping taxpayers&apos; wallets. Tapping public funds to support a private development that can&apos;t attract private funding is simply a subsidy, not the &apos;free market&apos; at work," Wagner told the committee. The bill would loan the money in two phases from the Transportation Fund to four coal-producing counties, which intend to purchase through-put capacity at the new Oakland port under the supervision of the Governor&apos;s Office of Economic Development in Utah. The funds would be replaced over time from the Permanent Community Impact Fund, a pool of money from mineral royalties to be spent on roads, recreational and municipal facilities, wastewater and other types of civic improvements in counties affected by mineral development. An export terminal may be a major deviation from how this money is normally used, but last April the Community Impact Board (CIB) voted to lend $53 million to Carbon, Emery, Sevier and Sanpete counties to acquire export rights at the Oakland Global Trade and Logistics Center, the bulk-freight terminal being built at the foot of the Bay Bridge. However, that deal was challenged by two groups contending it was not a legitimate use of CIB money. The original deal was to be reviewed by the attorney general&apos;s office, which has repeatedly declined to publicly give an opinion on the matter, citing client-attorney confidentiality. A consortium of environmental groups and Moab lawyer Christina Sloan sent petitions to Attorney General Sean Reyes, whose staff did not respond to their critiques. The fact that the deal has yet to be finalized nearly a year after the CIB approved it would seem to suggest the petitions raised valid issues and Adams&apos; bill is needed to work around rules governing CIB spending. Ted Zukowski, a lawyer with EarthJustice who wrote one of the petitions, believes SB246 may not fix the deal&apos;s legal shortcomings. "It looks like they are trying to launder CIB money," Zukowski said in an interview. "All the questions we raised about this use of CIB money would remain." But for Carbon County Commissioner Jae Potter, the bill is vital for the future of central Utah where coal mining and power generation account for 80 percent of employment. "This helps us shore up our community," he told lawmakers. "It gives the coal industry an opportunity to grow and adapt into the future. It&apos;s not a misuse of tax dollars." The Utah counties could use the port to move other commodities, such as soda ash, potash and salt, he added. With dropping coal consumption and depressed prices at home, U.S. producers are looking to overseas markets. But contrary to the bullish view offered by Utah officials, industry observers don&apos;t see much opportunity for U.S. coal in Asia. Coal exports were off 22 percent in the first three quarters of 2015 compared to the same period in 2014, according to the U.S. Energy Information Agency. "They are building 13 coal-burning plants in Germany. To say coal is dead is not factual," said Sen. David Hinkins, R-Orangeville, who then blasted the bill&apos;s many critics in the meeting room for meddling in the environmental affairs of Emery County. "Smirk all you want!" Yet according to an analysis released by the investment bank Goldman Sachs, coal&apos;s prospects for recovery are dim and demand for U.S. exports will be further eroded by rising production in India. "The peak and decline in seaborne trade volumes may arrive earlier than we had previously expected," Goldman analysts wrote in the Feb. 15 report. "Unlike most other commodities, thermal coal is unlikely to experience another period of tightness ever again because investment in new coal-fired generation is becoming less common and the implied decline in long-term demand appears to be irreversible," analysts wrote. Many Bay Area residents oppose coal being shipped through their communities and an Oakland lawmaker has introduced four different bills in the California Legislature that would hamper the development of such shipment facilities. This opposition indicates significant political risk for any Utah investment in such a port, said Chase Thomas of Alliance for a Better Utah. Potter said it was not fair for Californians to prevent Utah from shipping its minerals through West Coast ports, especially after that state&apos;s anti-coal regulations dampened regional demand prompting Utah to look overseas.